One day before the run. Me: I am nervous for the run. Demmit. It’s like getting married; my heart is pounding. My good friend: One of the factor for business failure is lack of self confidence because not equipped with proper experience and product knowledge. 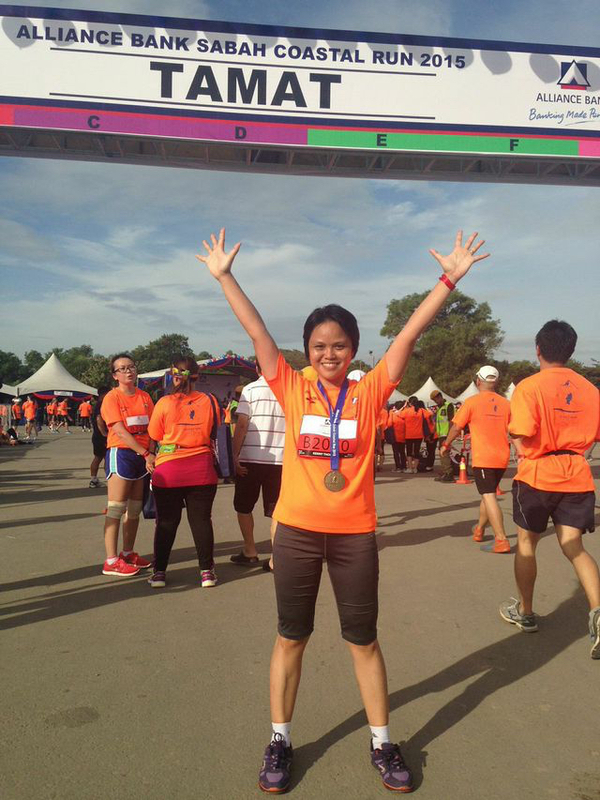 In your case, you are well prepared, have good knowledge of your run, so be brave and run for your medal. Take it positive, your heart is pounding because it can’t wait to receive the medal. Remember, you are running not to finish the race but to finish your commitment, replenish your energy and renew your passion. I wish you good luck. With this medal, I feel like singing Let It Go. 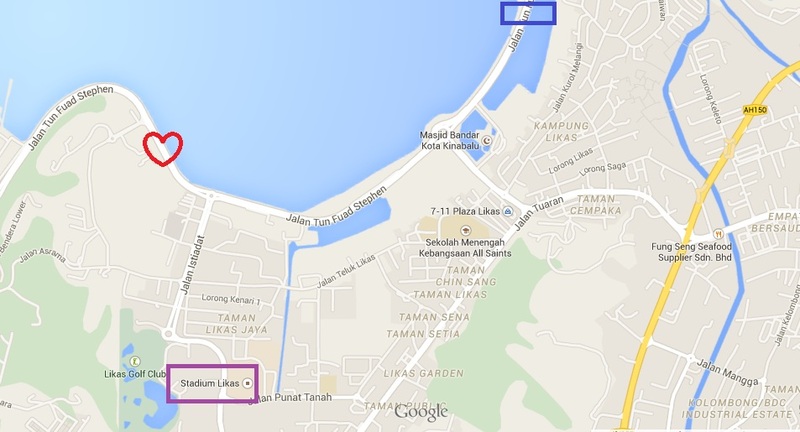 And to the sea gypsy kids in Lahad Datu, today’s 12km run I dedicate to all of you. I think I’ve made it 1 hour 45 mins. I lost the activity on my RunKeeper app coz’ I didn’t save it. Too excited to take off the arm band and take photo. Grrr. So, I made 20.7km for the first 11 days of the year at different places, days and times. I’m taking up the #100DaysOfMiles Challenge. You can find it on Facebook. Here’s my record. 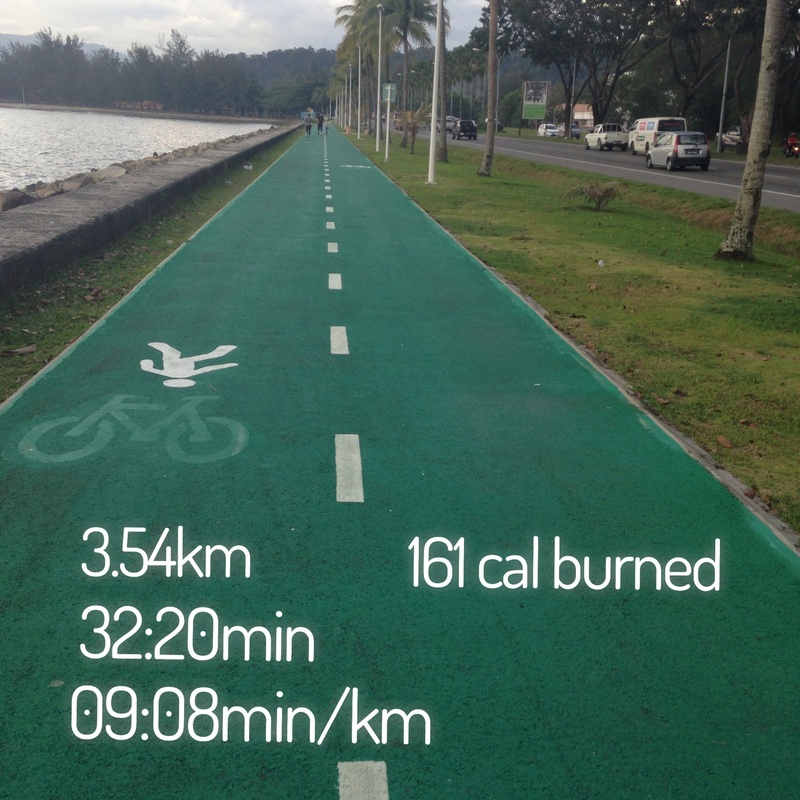 I run with my RunKeeper App to record them. I am so happy to see the progress. Run for fun, I think that’s pretty much the theme. Don’t really care about the pace, miles or even the timing. I just run. I am excited for this Sunday. I’ll be running 12k for my first event. 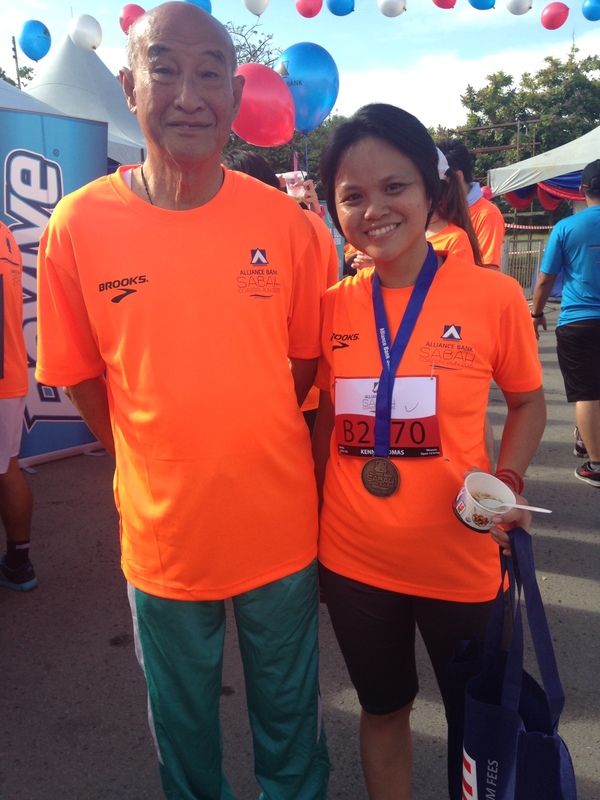 It’s the Alliance Bank Sabah Coastal Run 2015. I am excited! Good luck to all of you who are joining the run, too. See you there! I’m loving my office stairs. 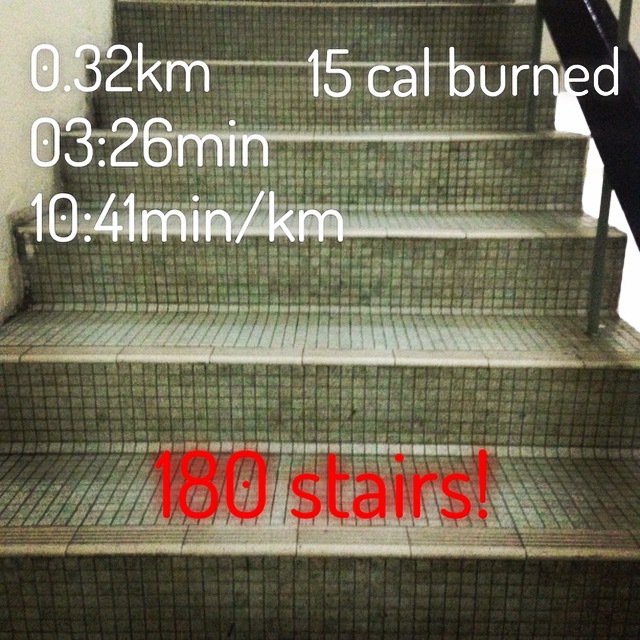 Yesterday post was about my first attempt of the year to finish 180 stairs to the 9th floor to my office. You can read it here. Did I say (in the post) I want to make 500 stairs? I did, right? Did I do it? Yes, I did it. The same stairs and different time. I used my phone’s stopwatch to check the timing. I did very well compared to yesterday. I screencap (I haven’t check if there’s any word for this) after every session. I’ve made three times. I think I am so proud of myself right now. If you notice the time I actually did it at 6:57am (morning), 12:48pm (noon) and 4:17pm (evening). 180 stairs x 3 times = 540! I’ve made it to 540 stairs. Beyond my target. And look at the timing; 02.34, 02.06, 02.08. Progress is what I see. So guys, start doing something. Little by little you’ll see the the progress yourself. Make sure you record to see all your progress. And say if you are sharing to your Facebook, Twitter, Instagram or other social networks, you are not looking for a thumb-like if you know what I mean. You may inspire someone out there. Be the inspiration and be inspired. I have lot of friends whom I knew from blogs like Carol, Stella, Sheena, Dazeree and her husband and many more. They are my fitness inspirations. And I also love Maria Kang, founder of No Excuse Moms. Oh you can find lot of them. All you have to do is to Google for it! I wish you all the best to your fitness journey. Be sure to eat, pray and love. It has been raining since I left my office few hours ago. I can easily choose to roll on the bed, doing nothing, and just to enjoy the cold outside. No. That’s lazy and not productive at all. I choose to update the blog before doing my workout later. Today is my rest day from running. I’ll run tomorrow and I hope it won’t rain. Since I know I am not running, I did the walking, and climbed up the stairs to my office this morning. My first check in at the office’s stairs. I counted them and there were 180 stairs to the 9th floor. It took me more than 3 minutes. My colleague commented the Instagram photo I shared on Facebook. “I did 1.43mins,” Vicky said. Well, I am very positive that I will see my own progress later on. First check in – 180 stairs, easy pie! You can do it, too! But, if you don’t like the stairs, you can choose to walk. I did my first walk logged into my RunKeeper app. Oh, thanks to my plan to go and buy my monthly parking ticket. 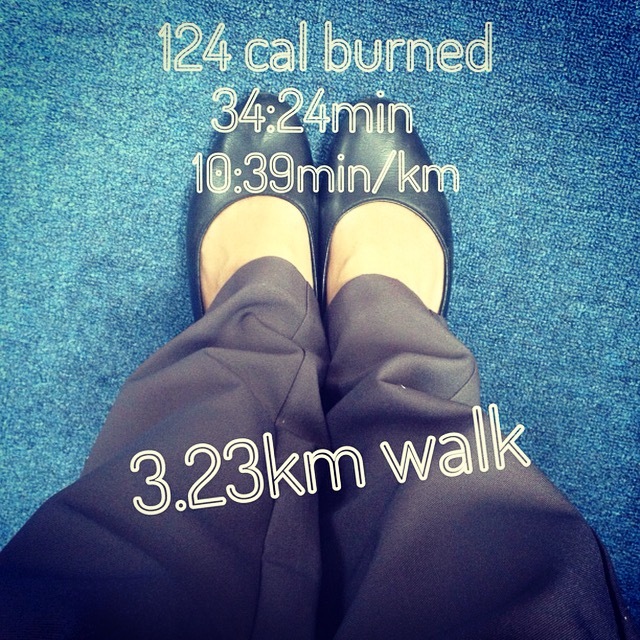 By just doing that, I did 3.23km walk today. Adding miles day by day! And, when I went back to the office, I climbed up the stairs again. 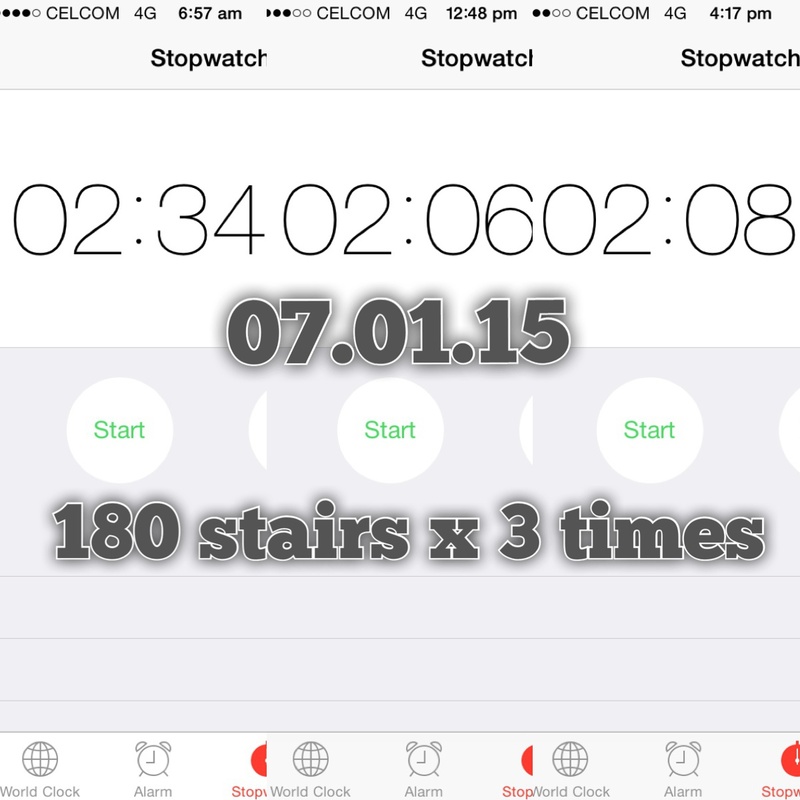 In total, I’ve made 360 stairs today! My plan tomorrow is – to do 500 stairs! Remember this, when you don’t run, do the walking and look for stairs. Good luck! It was a great run but I felt little bit weaker. I did a slower pace today. Dazeree told me that my body is still learning how to use the energy efficiently. And I think it was only my 3rd run, so yeah my body will get it right soon. Besides working on the running matters, I am also working on fixing my Diastasis Recti (DR). I have to do side planks, squats and wall push up. These are the exercises advised by Dazeree and from my Google reading, too. I think I will stick with Side Planks from Yoga practices and will see the progress from there. I am also working on the Shoulder Opening routine, also from my favorite teacher Esther Ekhart on Youtube. I’m taking the 3-weeks challenge for this routine. Argh, please please remind me to get done with the chart and stick on the wall! Do Sun Salutation, Side Planks, Squats, Wall Push Up. Do Side Planks, Squats, Wall Push Up and Shoulder Opening routine. I have shorter time to do all these. Taking all the extra time and to make it happen. No excuse, just do it. 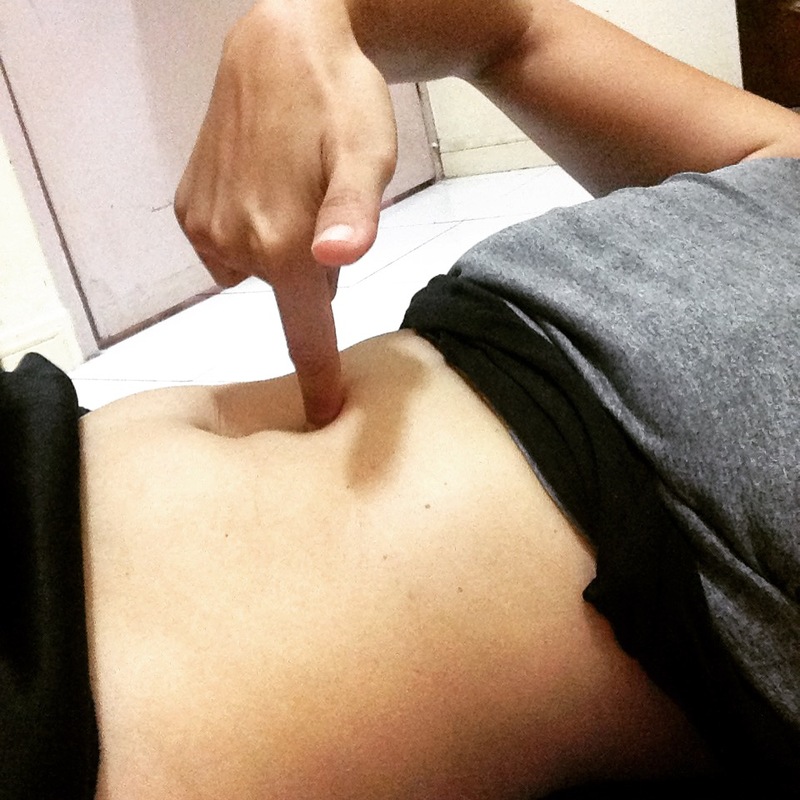 Yesterday, I posted my photo with my front body-tummy and shared it on my Instagram. Lucky to have Dazeree and her comment about self-analysis for Diastasis Recti (DR). I read a little about it when Daphne Iking, Sabahan born and one of the gorgeous Malaysian TV Hosts posted about it on her Facebook. That was the first time I knew about DR. And that was last year but I didn’t do anything to fix it. So, this morning during my workout, I took only a little time to self-check. And yes, I have Diastasis Recti. It’s 2 fingers gap, 2 inch deep and about 3 fingers from below and above the belly button. From my Google reading, it is a common problem face by every woman who had delivered a baby. I have three kids so I am not surprised to discover this. Frustrated? Oh yes and I’m going to fix it, no matter what. Dazeree had the same length, deep and gap like mine. She has been working out with side planks and squats to deal with hers. And it’s now half inch deep and appears only around her belly button. I’m going to concentrate on this as well. It’s still a long way to go. Gosh! I thought I was going to die this morning. I hate the side planks, I can’t even lift up my body. Few times I have to stop and breath. Oh, I have some little scratch on my elbow now! 10 x Sun Salutations – followed Ekhart Yoga on Youtube, it served for my Cardio workout. I know it’s not enough to reach where I am heading yet. But, slowly. Little by little. One step a day.